The preferred way to install Silverblue is with the Fedora MediaWriter application. See the Download page for details on how to create a USB stick to install Silverblue. NOTE: The following instructions are written in detail, assuming that you have never installed Fedora before. If you have experience using or installing Fedora, you may be able to skip much of these instructions. Do you want to retain any existing data on your system? If yes, you should consider using the manual partitioning method during the install process. Alternatively, if your system has an existing Fedora install on it, you could use the side-by-side install method. Do you want to do a fresh install and do not care about retaining any existing data on your system? If yes, you should consider using the automatic partitioning method during the install process. This is the easiest way to get Silverblue installed on your system. You may still use the manual partitioning method during the install process, but it will require some additional steps. After you have successfully created your USB stick, you’ll need to boot your system from the USB stick. Depending on your system, you might get lucky and it will boot from USB automatically. Otherwise, you’ll need to figure out how to access the boot menu of your system’s BIOS/UEFI and select the USB stick as the boot device. After selecting your language, the next screen of the installer allows us to make additional selections regarding the installer. We can configure the keyboard layout, installed language support, date and time, networking, and partitioning. In this guide we are only going to focus on the partitioning because of certain restrictions in this area when using Silverblue. However, if you have questions about some of the options of this part (or any part) of the installer, you can consult the Fedora Installation Guide. If you choose automatic partitioning, your job is almost done. Select the disk you want to install onto (in this guide we have only a single disk). Check the radio button that says 'Automatic' and click the big blue button at the top that says 'Done'. If your disk already has partitions on it, you’ll be presented with a dialog to 'reclaim' space. This means you are going choose which partitions can be deleted, so that the disk can be re-partitioned from scratch. In this guide, we are going to delete all the existing partitions so that we can use the entirety of the disk for the install. This is easily done with the aptly named 'Delete All' button. With your partitioning choice complete, the installer brings you back to the installation summary screen and the big blue 'Begin Installation' button is beckoning you to click it. Once you click the button, your disk(s) will be altered and all data on the disk(s) will be lost. Once you have started the install process, you can move on to the next phase where you will configure users. When choosing to manually partition your system, you need to be aware of certain restrictions specific to Silverblue. Due to how the operating system and filesystem are managed via libostree, only certain mount points can be created during the install process. These mount points are limited to /boot, /var, subdirectories under /var, and the root filesystem. Unfortunately, the installer (which is shared with vanilla Fedora Workstation) is not aware of these restrictions specific to Silverblue and will happily accept your custom partitions without error. Only when you try to boot your system will you be made aware that you have made a mistake. With those restrictions in mind, let’s try to manually partition our system. The first screen you’ll see is the "Installation Destination" screen. From here, you can select which disk(s) to use for the install and choose the partitioning method. For this guide, we only have a single disk, but you might have more than one disk in your system. In order to select the manual parition method, click the radio button labeled "Custom". This will launch you into the "Manual Partioning" screen, which gives you a minimal overview of the existing storage configuration. In order to see all of the partitions on your disk, you should click the arrow next to the "Unknown" disk. Now we can see that we have three existing partitions on the disk: two ext4 partitions and a swap partition. At this point, you should (hopefully!) be able to recognize your existing partitions and make sure they remain intact if you wanted to keep the existing data on your disk. But for this guide, we do not want to preserve any data, so we are going to start deleting all of our existing partitions to start fresh. 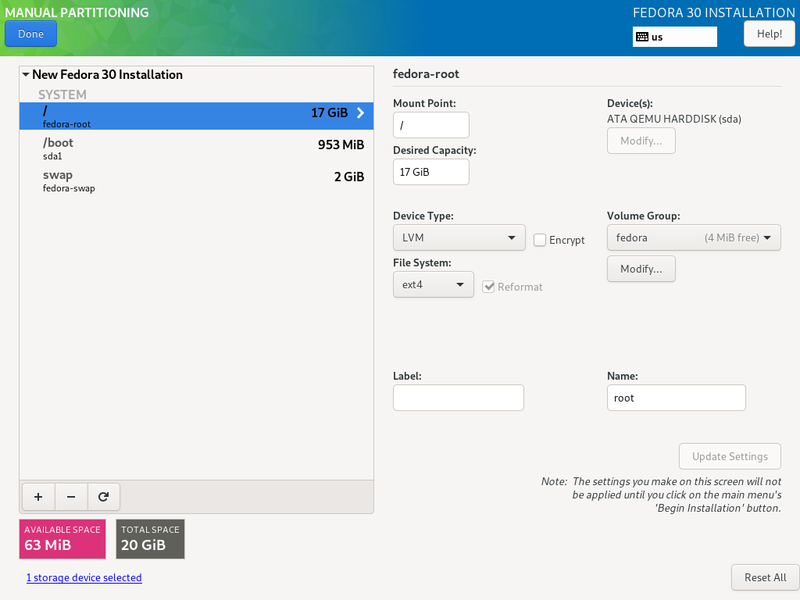 We start by selecting the first ext4 partition in the list labeled "fedora-root". Then we click the button that looks like a dash ("-") to mark the partition to be delete. This brings up a prompt asking you to confirm that you want to delete the partition. Repeat this process for all the partitions that you want to delete. In this guide, we have removed all the paritions from the system and have a blank disk to work with. We’ll create our first partition by clicking on the button that looks like a plus sign ("+"). This first partition will be our /boot where critical pieces of software required to boot your system (like the initramfs and vmlinuz executable). It doesn’t need to be very large, so we set the size for 500M. You can create additional parititions such as /var/log or /var/lib/containers, but for this guide, we will move on to creating the root partition. We’ll finish this part of the install process by creating the root partition for our system. We can leave the size field blank during this step and the installer will automatically use the remaining free space on the disk for the partition. With all the partitions created, we can inspect the final configuration before proceeding. It’s worth noting here that the default partitioning scheme uses LVM as the default partitioning scheme with an ext4 filesystem. You can change this during this partitioning phase to use standard partitions or an xfs filesystem, but that is outside the scope of this guide. After confirming your partitioning choices by clicking the big, blue "Done" button at the top of the screen, you are brought back to the "Installation Summary" screen. Here you have a chance to inspect your choices one last time before starting the actual installation proper. Once you click the big, blue "Begin Installation" button, your disk(s) will be altered and any data on them may be lost forever. Once you have started the installer, you can move on to the User Configuration section of this guide. Eventually, the installer will finish and you will be presented with a big, blue button that says 'Reboot'. This will (obviously) reboot your system and you’ll be able to login to your Silverblue installation for the first time!